Of all the wedding invitations, of all the cards, in all the world, this is the one that speaks to you. Well, if you are a big fan of the film Casablanca, regarded as being one of the most romantic films in the history of Hollywood, you will certainly have a lot of love for this wedding invitation by Five Dollar Shake. As it draws on the style and grandeur of one of the classic movies of all time, it manages to have a double impact. The card itself has a very minimal style, attractive enough to appeal to people all by itself even if you have no knowledge of the film it has been inspired by. However, the traditional style of the stationery is clearly enhanced when you consider the film that is draws influence from. That was a love story that many couples look up to, and if you are keen to recreate that feeling, or you just want to have a brilliant party that everyone will remember for a long time. The style of the card comes with an ivory finish, which perfectly complements the pearl effect on the card. There are also Swarvoski diamantes and a crystal heart, all of which combine to make this one of the most stylish and attractive wedding invitations you can hope to find. 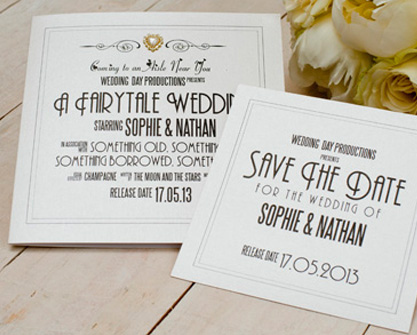 If you are keen to find the perfect wedding invitation that will have people saying “here’s looking at you kid” every time they see it on their mantelpiece, this is exactly what you are looking for. The design is also available on a wide range of stationery options, so you can spread the word about the happy occasion in as many ways as you can think of! Tags: Casablanca, Crystals, Great Gatsby, Monochrome, Movies, Sophisticated.